I was an odd child. All through grade school, my favorite ensemble consisted of denim overalls, a T-shirt and cowboy boots – or moccasins. We were, after all, living next to a Cherokee reservation. It is truly a miracle that I reproduced. During the last two years I’ve experienced a retrograde in the way I dress. No matter the occasion, I wear carpenter’s jeans, a T-shirt and moccasin boots or shoes. Of these three fashion accoutrements, the moccasins are the most interesting and endearing. They are, in essence, the equivalent of hand tools for your feet. For years, I’ve worn all manner of hard-soled boots at work and play. My favorites – Gokey snake-proof boots I’ve owned for nearly 20 years, protected me from all sorts of nastiness. But protection comes at a price. I can wear these boots for only short periods. As I’ve slipped back into my grade-school ways, I’ve rediscovered moccasins and moccasin boots. These are the only shoes that I regret removing at the end of the day. Like hand tools, these shoes transmit every detail of the ground I’m covering – instead of homogenizing it. They mold to the shape of my feet, instead of twisting my toes to their shape. Also a bonus: Many of these boots are stitched by hand, are re-soleable (a money-saving miracle) and are definitely not disposable footwear. There are lots of shoe-makers out there who can provide you with boots that will ease your long days in the shop. I have become fond of Quoddy boots, which are made in Maine. They are expensive, but I can guarantee you that they are worth every penny. I saved for many months to buy Grizzly Boots from Quoddy and have beaten them into the ground. I’ve stomped all over the Western world. I’ve stood on my feet all day in them and regretted removing them at the end of the day. I’ve kept them oiled so that they last as long as their owner. My favorites are Beaver Tracks from Moose Lake Minnesota and Catskill Mountain Moccasins from Catskill New York. Both are also expensive, but then handmade custom footwear always is. My feet always thank me after a long day though and that’s worth the price right there. The kitty sets them off nicely. WTO post: “These Boots are Made for Woodworking…what do you wear?” – 67 replies and almost as many foot wear recommendations. Is that a store-bought bed? With faux raised panels? I am very intrigued by this. The Grizzly Boot link you included looks like it comes with a hard sole, but your boots look like they have a soft sole. What is the sole on your boot made of? Crepe soles. They will do whatever you like. Chris; Just when I’ve gotten control of reactive tool buying, solely on the basis of your blog, you head in to fashion choices . . . “Oh yes, this will be mine” (Wayne’s World). now we are going to have a bunch of woodworkers running around in mocs. The price for vintage mods on ebay will double within days. You can make them yourself. I’ve been thinking about trying. Ha! Moccasins are as fashionable as leisure suits. 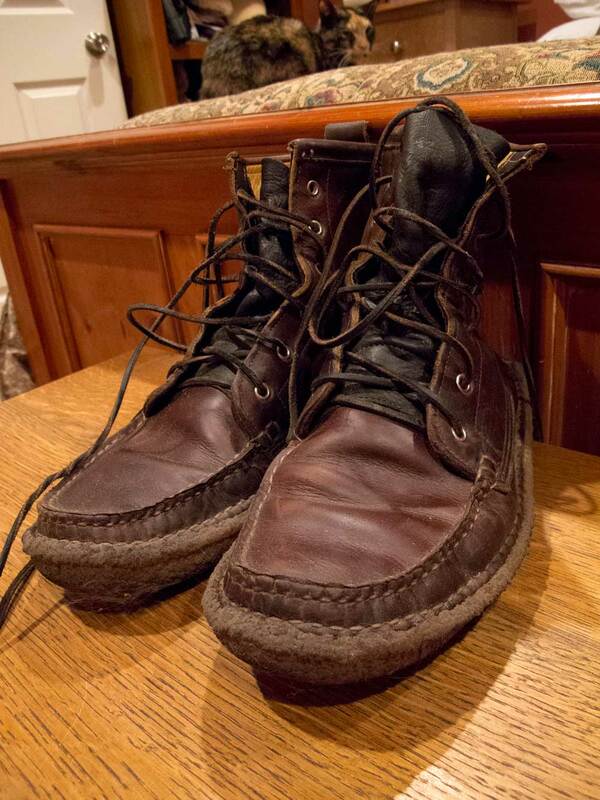 Red Wing model 899. Though Red Wing has outsourced some of its production, you can still have them custom made to measure in Minnesota. They cost about 10% more than the mass produced Red Wings but will outlast most other boots and still remain comfortable. My favorites are made by Russellmoccasin.com. Hand made to fit your foot. These are the best fitting, longest lasting most comfortable boots that I’ve ever owned. So any options of soles, leathers, colors that you can get exactly what you want. i agree. i have two pair. the best boot i have ever bought. Am I the only one who actually prefers to be barefoot in the shop? In the winter, I wear socks, but the rest of the time, usually nothing (on my feet, that is). Yikes. Bare feet and sharp chisels. Count me out. Now all we need to do is get you in some Levi’s 511 (skinny jeans) and a james perse T-shirt, both made in the USA, and we can head down to Williamsburg (Brooklyn) to hang out with my hipsters friends. He is indeed a porkpie hat and a faux navy pea coat away from being Portland(OR) hipster. Oh come on. Only dorks wear moccasins. Megan cracks up anytime I have them on. If you really explore the Quoddy site you will find this color of the boot with a black crepe sole, and find it is on sale for a savings of $125. Black Vibram sole. Still a nice boot. Save yourself about $300 and get a pair of Clarks Natureveldts. They are comfortable, wear like iron and can even be worn out on the town with your favorite pair of khakis if need be. And…they can also be re-soled. They seem to have stopped making carpenter jeans but these are great as well. For shoes that form to your foot and provide good support, nothing can beat Haflinger shoes. I have plantar faciitus and very high arches and the only shoe that has helped without inserts has been the Haflingers that were recommended by a good shoe store. They are made in Germany of thick boiled felt built over cork soles which exactly conform to your foot after a few days of wear. You can buy them for about $120.00 at good shoe stores. I hope the term “tools” won’t extend to toothpaste or underwear recommendations.